In the race to become US president, there have been numerous momentum swings in the three months following the Iowa caucuses on 1 February 2016. In Iowa, Hillary Clinton began strongly with a Democratic win, while Donald Trump lost his first major vote to Ted Cruz. Since then, all of Trump's competition, including Iowa winner Ted Cruz, have bowed out and Hillary has fought off numerous Sanders serges. As the party conventions approach, the picture has grown clearer and it seems likely Hillary will battle Trump for the White House on 8 November 2016. Trump is now the Republican presidential candidate after Texas Senator Ted Cruz and Ohio Governor John Kasich both withdrew from the race. At this stage, Paddy Power Sports has slashed Trump’s odds to 1/200 for becoming the Republican candidate. Trump’s backers are now better off considering his 2/1 odds for winning the 2016 US presidential election. However, Trump will have to spend the coming months convincing the Republican Party to unite behind him. Just a day after winning Indiana, former US presidents George Bush and George W. Bush both released statements declaring they would play no role in the upcoming election. Beyond those non-endorsements, Trump has deeper concerns within the party. Although some members are getting behind him, they openly admit to doubting his politics. US Congressman Peter T. King has urged for party members to support their candidate, but openly undermined Trump by describing him as "a guy with no knowledge of what’s going on." "Tonight is the turning point." The evangelical Republican candidate then gave hope to his supporters by claiming 30 formally bound delegates at the Colorado Republican conventions on 19 April. Colorado, however, saw the start of Cruz’s downfall. "The voters chose another path." Hillary Close to Beating Bernie? While the Republican candidacy is now clear, the Democrats are still waiting for their definitive prospect. Hillary had been expected to move clear of Bernie Sanders in Indiana, but the opinion polls betrayed the former US Secretary of State. Ultimately, it would be the Vermont Senator who would defy the polls to win by 44 to 38 delegates. As it stands, Hillary leads Sanders in pledged delegates by 1,701 to 1,411, with 2,383 needed to win the nomination. With 1,114 Democratic delegates remaining, it would seem possible for Sanders to beat Hillary if he claimed all of them. However, the issue with the 1,114 remaining delegates is that 719 of those have status as superdelegates. These delegates are elite Democratic Party members who classify as major elected officials, notable party figures or select leaders of affiliated organisations. Even after pledging, they have the power to change their minds. The reason why Sanders’ supporters should be concerned is that Hillary leads him by 522 to 39 of the 719 superdelegates. Sanders has little to no mathematical chance of winning without somehow convincing all of the superdelegates to pledge their votes to him. This is reflected in the odds at Paddy Power Sports, where Sanders is set at 25/1 and 16/1 for becoming president and the Democratic nomination respectively. Although she looks like the clear leader, Hillary recently told CNN she respects Sanders for not giving up. Democratic insiders believe Hillary is refraining from pressuring Sanders because she does not want to split the party, especially with the goodwill he has fostered among his supporters. Hillary is not a definitive candidate as of yet, but she is considered by Paddy Power to be the 4/11 favourite to become the next US president. While Hillary waits for Sanders to concede, Trump begins his campaign amid the challenge of uniting a divided Republican Party. 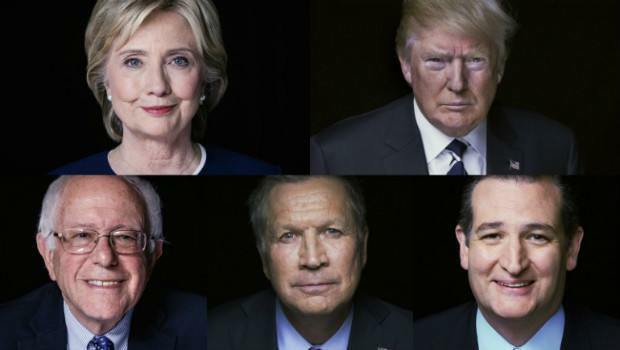 For all current 2016 US presidential election odds, visit Paddy Power's stellar online bookie today!